Brad Pitt‘s new World War II drama ‘Fury‘ opened at No. 1 at the box office and has officially defined what this October has been about: long, R-rated movies featuring huge movie stars bucking the usual trends and out-grossing their family friendly competition. Between this and ‘Gone Girl,’ it looks like grown adults are heading to their multiplex more than ever these days. 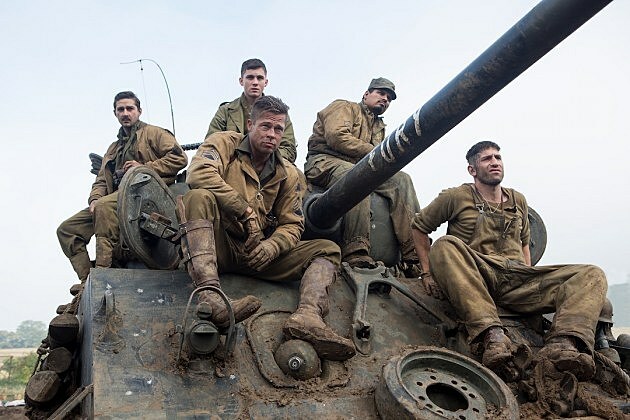 ‘Fury’ didn’t open quite as well as ‘Gone Girl.’ Still, $23 million for a pitch-dark and nihilistic war drama is nothing to scoff at, especially since the film cost a surprisingly modest $68 million to produce. We’ll see how it does in the weeks ahead, but unless audiences completely and totally reject it, it should end up doing fairly well in the long run. Speaking of ‘Gone Girl,’ David Fincher’s new thriller continued being a smash hit, dropping to the second place spot (and a small 32%) with $17 million. The film has now made $107 million at it doesn’t look like it’s slowing down quite yet. Considering its moderate budget and length, this is nothing short of miraculous. The champagne probably hasn’t stopped flowing at 20th Century Fox for the past three weeks. The second of the weekend’s new releases, the animated ‘The Book of Life,’ opened in third place with a solid $17 million. That would be a disastrous number for a bigger and more expensive animated movie, but with a reported budget of only $50 million, it should be all right. It’s not going to be a smash hit, but it stands a strong chance of ending up in the black. In fourth place, ‘Alexander and the Terrible, Horrible, No Good, Very Bad Day‘ showed some surprising legs in its second week of release, grossing $12 million for a $36 million total. Those aren’t amazing numbers, but they’re solid enough. The film should do well enough in the long run, it just won’t blow anyone’s socks off. And that brings us to the third and final new release of the weekend. ‘The Best of Me‘ opened in fifth place with a weak $10 million, a rough start for a romantic weepy in a year full of very successful romantic weepies. The only real consolation here is that it didn’t cost much. It may manage to break even. Speaking of things going wrong, ‘Dracula Untold‘ plummeted to sixth place, dropping 57% and making $9 million. With a current total of $40 million, the film is officially a rough start for Universal’s newly rebooted monsters universe. Expect the upcoming remake of ‘The Mummy’ to ignore this one completely. With the the exception of ‘The Judge‘ and its mediocre gross, the rest of the top 10 was full of winners. ‘Annabelle‘ continued to do very strong business while ‘The Maze Runner‘ and ‘The Equalizer‘ continued their death marches to $100 million. They should be able to get there, but it’ll be very close.